This quick and easy recipe for Kale Chimichurri Sauce makes a tart, earthy sauce perfect for serving on beef, chicken, fish, salad and more. It’s good to do things that scare you. Doing so not only builds character but also builds your resiliency. It naturally raises your inner bar for fear, making you stronger. And afterward, you are a little braver than you were before. But even knowing all of this, it’s hard to make that choice to say yes to the things that scare you. That yes is a very big thing. 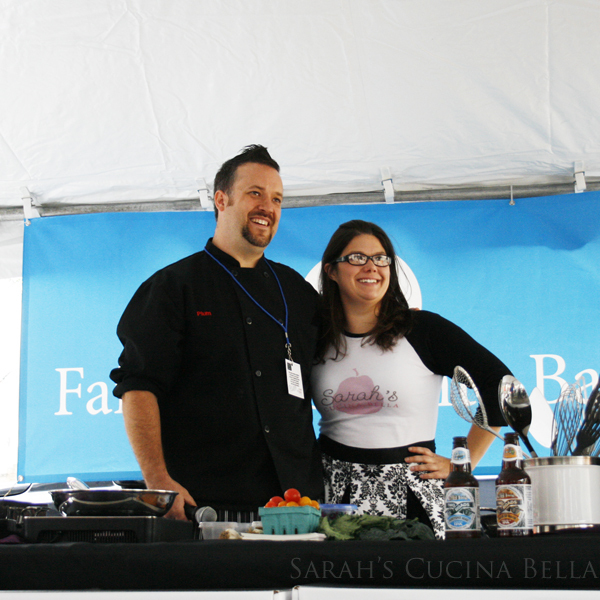 When I received a phone call from Chef Plum weeks ago asking if I would do a cooking demo at the recent Taste of Greater Danbury celebration, I was practically speechless — while exciting, and certainly an honor to be asked, it was way beyond my comfort zone. With no experience doing live cooking demos, I was a little scared. What if I stumbled? Or forgot what I was making? Or make a complete fool of myself? All the same, I really wanted to say yes. So I consulted a few close friends, mulled it over and finally — late at night — sent a simple reply saying that I’d do it. Once I said yes, everything fell into place. I chose my recipe, mentally prepared and picked up all the ingredients I needed. The day of the demo, I did a test run at home to double check everything. Then off we went. My kids came with me (in fact, Will took the above photo, among many others). Then I did it, and loved the whole experience. Doing a live cooking demo was so much fun — and even more so since I had such an energetic host to work with. Seriously, Chef Plum was awesome to share the stage with. 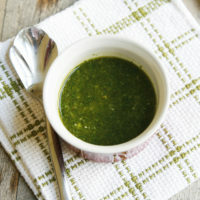 For my demo, I made a quick and easy recipe for Kale Chimichurri Sauce. This tangy, garlicky Kale Chimichurri Sauce has so many uses. It’s delicious drizzled on steak, perfect on grilled chicken and divine on fish (especially mild white fish like tilapia). You can use it as a salad dressing, stir it into baked potatoes or even finish pasta with it. Or you can create an entirely delicious and unexpected fresh take on Caprese Salad by tossing 1/4 cup of the sauce with 2 cups halved cherry tomatoes and a 1/2 cup diced fresh mozzarella. Any way you enjoy it, this is a super easy sauce that takes plain foods and makes them extraordinary. Add the kale leaves, garlic, olive oil, red wine vinegar, salt, black pepper and crushed red pepper flakes to the bowl of a food processor. Process on high until the kale is chopped into uniformly small pieces. Scrape down the sides of the bowl and process again, until the garlic is chopped finely. This sauce is great on chicken, fish or beef. 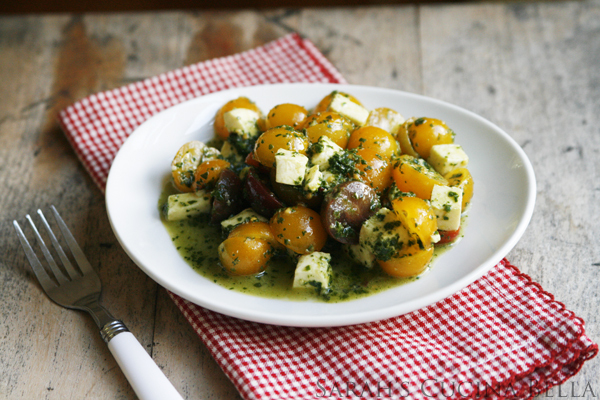 It also can be used to make a delicious tomato caprese salad with halved cherry tomatoes and cubed fresh mozzarella. You’re so brave! I definitely agree with doing things that scare you!